Whilst the answer to the question posed in the title could be electricity, in the context of this article it is in fact ‘believability’. So why this article and more importantly what is believability? I was prompted to write this article after my son and I reviewed his Silver Creek layout exhibited at last years FEBEX. For those who did not attend the show Silver Creek is an American On30 logging layout based in 1930s Colorado. In the middle of last year we both came to the conclusion that Silver Creek was not working as a layout, whilst all the constituent parts looked fine in isolation, as a whole there was something missing. 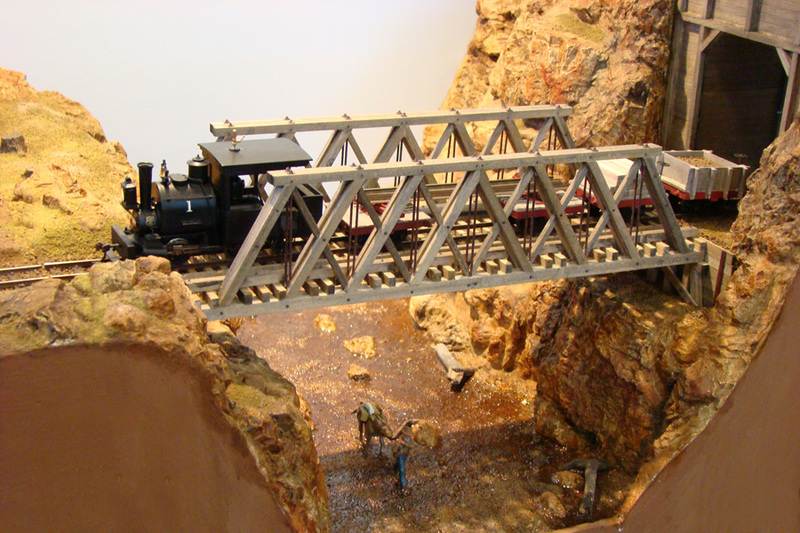 The standard of modelling was good, especially the scratch built engine house, workshops and bridge. There should have been plenty of interest for both the operator and the viewer, but it did not all gel as he had hoped. Much discussion has ensued and the following are the conclusions we have reached and the planned way ahead to what will hopefully be a better layout. Although an early picture of Silver Creek before the addition of the bridge (see other image) this picture gives a good idea of its uncluttered appearance. Due to space constraints the current layout depicts a base camp and maintenance facility that supports the front line logging operations and in this lies one of the major issues. When viewing the layout the purpose of what you saw in front of you was not obvious with locomotive movements appearing random; in fact you could have been excused for thinking it was a contrived way of displaying a large number of narrow gauge locomotives*. In addition the overall scene was too flat and nowhere near cluttered enough; in short the layout was not believable. Select the stock according to the ‘purpose’ in category 1. Give the layout a more obvious purpose. 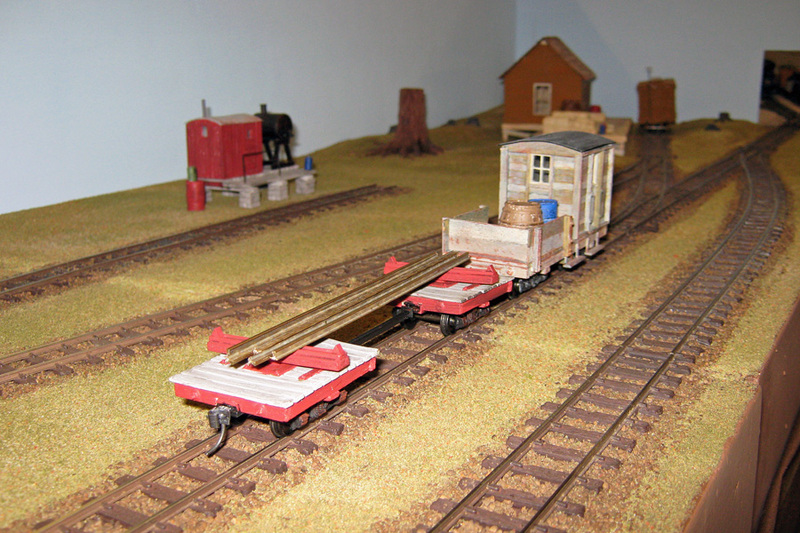 We decided that rather than a terminus arrangement with a fiddle yard at one end we would convert the layout into a ‘through’ configuration with fiddle yards at both ends. This would allow us to run supply trains in from an external location and run ‘through’ log car trains in from the lumber camps and out to that location. We could still handle equipment and supply trains out and back to the lumber camps but now we had more of an overall purpose and some justification for greater traffic movements. There is a further advantage with the ‘through’ configuration and that is the possibility to extend the layout in either direction. In the old arrangement any extension could have only featured a logging camp which in itself, whilst being potentially a modelling challenge, would not have offered any additional operating potential; now we can look at a variety of options for future expansion. Give the layout a more cluttered and undulating appearance. Whilst the level of clutter of individual scenes was effective the layout as a whole was just to ‘clean’. American logging operations were predominately ‘scruffy’ in their day to day ‘housekeeping’. However scruffy should not be confused with inefficient as the owners would not usually waste time and resources on keeping the operations tidy. Instead they preferred to ’move on’ with what they could transport, not wasting time to clear up behind them; the layout did not represent this reality. For the same economic reasons track work was kept to a minimum so features such as the extra long passing loop at the front of the layout needed to be revised and shortened. This one move would enable the ‘scenery’ to be brought more into the body of the layout so introducing a more undulating appearance. In addition running the ‘main line’ off the layout (to the left of the engine shed as viewed from the front) would open up the possibility for more scenery on that end of the layout. 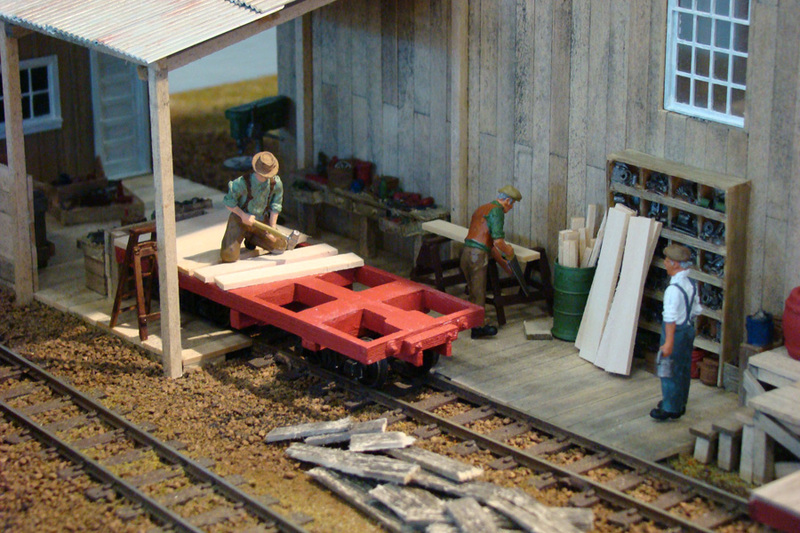 Whilst the Peco 0n30 turntable looked OK and had operated reasonably well it was oversized for the layout and complicated the track-work in the area outside the engine shed, it was also not of wooden construction. So it was decided to purchase a somewhat smaller turntable from Kitwood Hill Models that would occupy less real estate and look more in keeping owing to its predominately wooden construction. Select the stock according to the purpose. The bridge board will stay but the scenery leading to it will be extended so as to introduce a more gradual transition from the main layout. Whilst it is nice to have a great collection of locomotives the lesson we learnt was to ensure they are right for the layout and the operations being represented. This means that going forward the largest locomotives to be found operating on Silver Creek will be Shays and Climaxes and the facilities will be scaled down in order to match them. The jury is still out as to whether the engine house is reduced to one stall from the current two but the decision may be made for us once we take the main line past the shed to exit the layout to the new fiddle yard. So there is a lot to do including some fairly major surgery to replace the turntable and ‘lift and shift’ track-work.. Once all is completed hopefully we will be left with a believable layout. All being well you will be able to judge for yourself as we will work with the objective of Silver Creek being at next years FEBEX.